The title question is the shadow on the back of every web owners mind. The truth is, nobody knows exactly how search engines factor in metrics, and Google is keeping shtum about their methods of calculating PageRank (or its equivalent since PageRank hasn’t updated for a long time, and is not likely to do so again). However, through a series of tests, research, experience and understanding Google Guidelines, SEO service providers can work out some of the key ingredients web owners need to boost PageRank. The information architecture (IA) of your website is the design and layout. If the design looks low-quality, you give the impression your product is low-quality and they will leave. Search engines are all for user-experience. Google crawlers determine this by collecting data about the number of visitors to your site, how long they stay and how many pages they look at. Once social media networks allow Google access to data as Twitter did earlier this year, we can expect likes, shares and favourites to be included in metrics as well as it is a good indicator that the quality you are producing is of a high standard. Keyword use has been played down somewhat since Google introduced the Hummingbird algorithm. However, it is clear from search results that the algorithms still focus on keyword indexing over longtail search terms – which theoretically it should do. But search engines still rely heavily on keywords for indexing and deep linking pages before they are able to produce a list of results that most closely resemble the search term. Keywords will never die. The time it takes for your website to upload – particularly on mobile devices – impacts the number of visitors to your site. You have up to four seconds before visitors leave. Assuming you keep a blog – which you need for visibility and driving traffic – the quality of third party sites you link to play a role in authority metrics search engines use to identify partners they can trust to promote. You do not have to link to a site in every article you write. But whenever you do, make sure the page you link to is authoratitive and offers your readers real value. 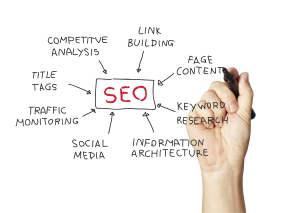 This gives you creditability with search engines and followers. The number one metric search engines give the most kudos for is genuine inbound links. Essentially links pointing towards your site should ideally be placed independently by a third party who is the owner of a strong site. If search engines deem you have tried to manipulate PageRank by planting spammy links across the web on low quality sites, you will be penalised and lose your rank position earned through inbound links. It is therefore good practice to run analysis checks on inbound links in Google Analytics and remove any links you feel will cause more harm than benefit.